...our puppy dog spotted this guy for the second or third time this week. Have you had watermelon yet this year? It's a sure sign of summer! Ha ha! I love it and I do hope that little turtle got to enjoy his watermelon. I love me some watermelon. Hope you're doing well. Awww..... what a cutie! We used to have two turtles named Mr. and Mrs. T when I was a kid. I bought one to share while my kids were home. Don't know who I'll share the next one with. :D Love that melon! Did the turtle eat it? Hope you're feeling fine. We have! And boy, was it good :) I bet the turtle loved it. Haven't seen our "resident" turtle Mr. T since early last year. Fun to find such wonderful creatures in your garden! It's not been quite hot enough here yet to break out the watermelon. LOL. Maybe this weekend if it stops raining we will break one out! Have a wonderful and safe Memorial Day Weekend! Oh goodness! Is it a snapper? I can never tell the difference and they scare the heck out of me!! I've had watermelon a couple of times this season. I'm most excited about the rainier cherries we bought today. My grandsons would want to take that turtle home! Such a sweet pic of your visitor! Yes, we've had watermelon and it was so delicious. Yours looks so good fresh cut! That is a great shot of that turtle! And sharing your watermelon, too sweet! I bought some yesterday, it's so yummy and oh so juicy! This is the best time to enjoy fruit, when the weather starts getting warmer. So cute! Did you name your turtle? I haven't had any watermelon yet, but yours looks scrumptious! It's funny because I don't really like watermelon flavored things, but I love real watermelon. We just got some watermelon from the grocery store yesterday....can't wait to dig in. A sure sign of summer. cute photo. No watermelon yet but I will soon! Hi Stacey! 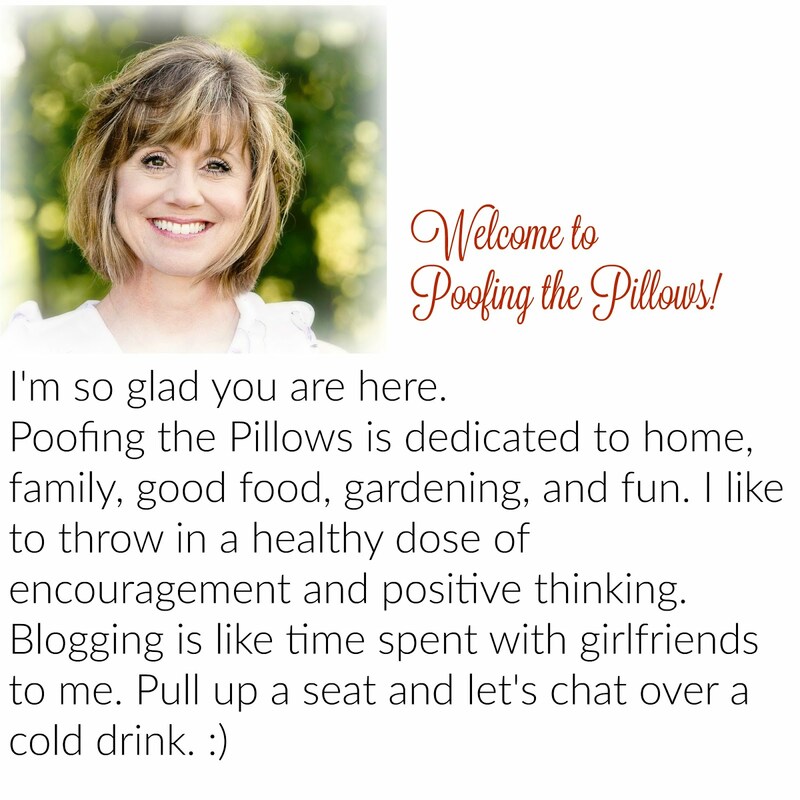 Thanks for visiting my blog yesterday! Love your pictures! yes, I'm sure watermelon will be on our menu beginning this weekend! Let summer begin!! Just purchased some "ready to eat" watermelon in the grocery store today, Stacey! The local plants are in greenhouses here waiting to be planted. :) The turtle looks cute! I had to forward this to the hubster. 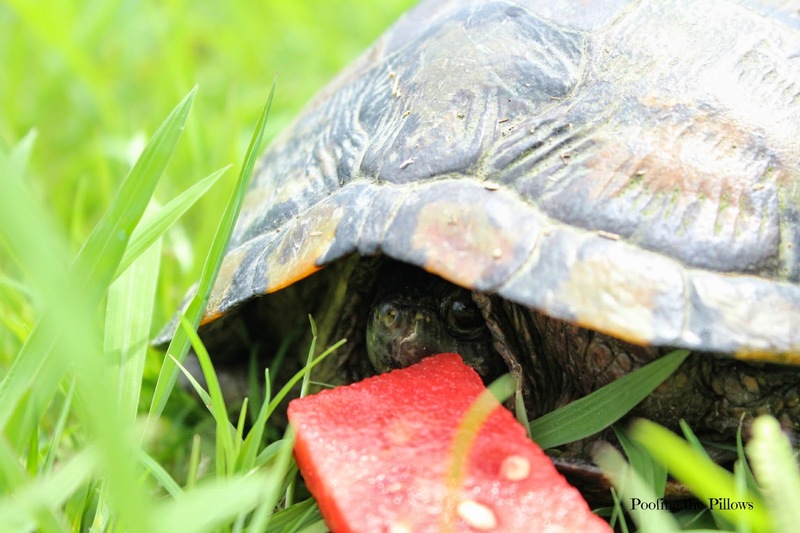 He loves watermelon and will get a kick out of your visitor!! my dad used to love watermelon, but I'm just not much of a melon person of any type. Not sure why... Have a great weekend! The turtle pic is very cute! What a lovely house-guest you have. I'm sure he enjoyed the treat. Hi Stacey, when will it stop raining for us?? We needed it so badly but now that we are out of the drought, it needs to stop. Getting a bit much. Hope you are doing okay in your area. Flooding is all around us but we are okay here. Prayers for those folks that have lost so much in the floods. What a cute post! Only you could share such a fun post. I love the watermelon picture and the turtle picture! 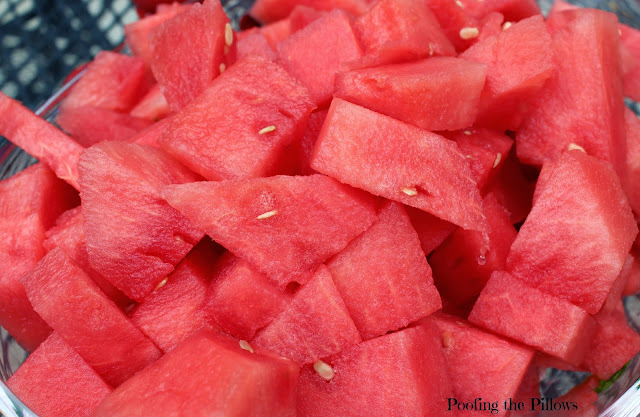 Summer at it's finest, and the bright red color of the fruit fits perfectly with your blog! Just realized I didn't finish my comment...LOL. Yes, we have had watermelon. It is a summer staple for us! I want to come over you have the nicest kindest home. We son loves turtles, me too! !